The pair had been scheduled to meet in Rīga earlier this week as part of a get-together of all three Baltic prime ministers but Ratas was unable to attend due to conditions at Rīga airport. Having sketched out the state budget - and assured the press of the continuation of the LSM English and Russian services among other things - Kariņš heads to Estonia to discuss bilateral relations and possibilities to strengthen them; regional transport and energy projects involving both countries; regional security issues; as well as topical issues on the European Union's agenda, including Brexit and the multi-annual budget process. The Prime Minister will also give an interview to the Estonian newspaper Postimees. At a joint press conference with Ratas at Stenbock house, Kariņš said it was "symbolically important" that he had chosen Estonia for his first foreign trip. "The relationship between our two countries is a relationship that goes back to the 1300s," he said, "It's important that all all levels we continue our wonderful cooperation at governmental level but also among our companies and among our tourists going from country to country. The more we exchange, the richer both of us will be." Kariņš also praised Estonia's renowned e-governance credentials domestically and its championing of a single digital market in Europe, saying he was particularly impressed that when he was in the government meeting room "there was no paper on the table," hastily adding that a similar situation prevailed in Latvia. "Keeping unity and close relations between the Baltic countries and between Latvia and Estonia is so important," said Ratas, adding that he was glad Estonia had been chosen as the destination for Kariņš' first foreign visit. "But we need to move on with the large-scale projects we have such as Rail Baltica and the synchronization of our electricity systems," Ratas said, "Both of these projects are very important to keep Baltic cooperation going." 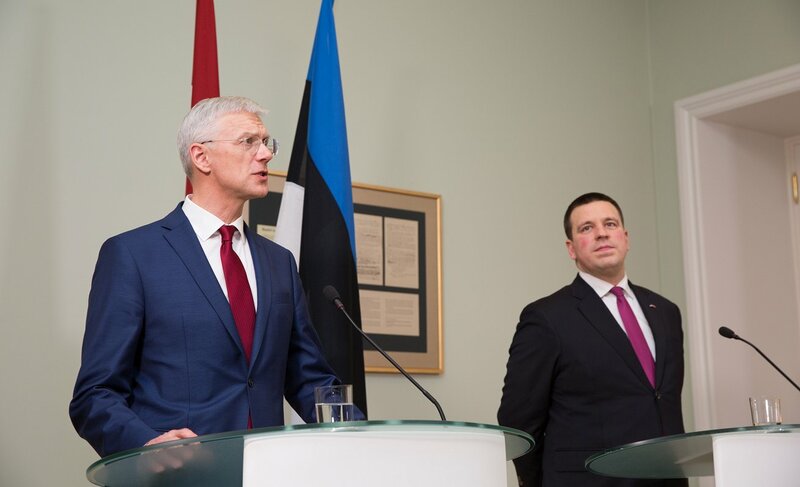 Ratas confirmed that the Latvian president would visit Estonia in April and said the development of "cross border digitalization" was another topic they had discussed. Estonian journalists also asked Kariņš if he was pleased large numbers of Estonians visited Latvia to stock up on alcohol and if he had visited the new IKEA store in Rīga. His answer was positive on both counts.